When a highly respected lama visits another monastery in the Tibetan Buddhist tradition, he is greeted by a painting of the Eight Auspicious Symbols. 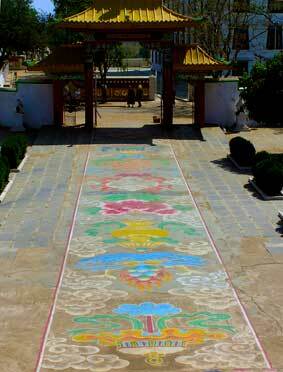 The painting is created in front of the temple, and usually drawn on the pavement with colored powder, colored flower, rice, chalk or paints. The picture on the right was made in 2008 at the Drepung Loseling Monastery in Mundgod (South India) to welcome His Holiness the Dalai Lama on the occasion of the opening of a new temple within the complex. 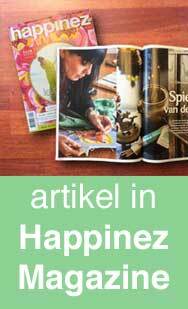 For the recent visits of the Dalai Lama to The Netherlands (in 2009 and 2014), Carmen Mensink was asked to create such paintings to welcome him to the low lands. A very big honour. She designed and coordinated these big projects and painted them (assisted by some of her thangka students). 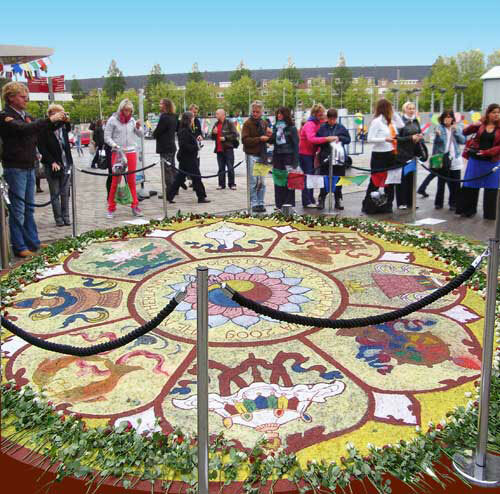 For both occasions Carmen created two different designs: for the Dalai Lama’s visit to Amsterdam she made a 16.4 ft (5 meter) wide lotus circle and for his visit five years later to Rotterdam Carmen painted a 30 ft (9 meter) long artwork. 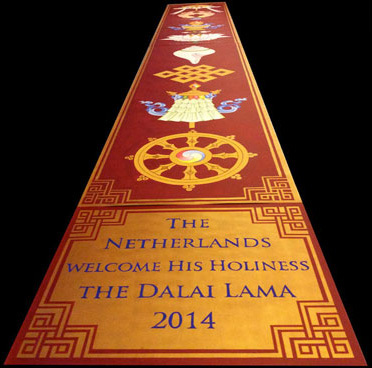 On occasion of the Dalai Lama’s visit to Amsterdam, The Netherlands, Carmen was asked to paint the Eight Auspicious Symbols, right in front of his teaching hall. 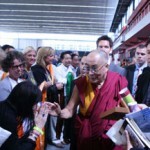 For the Dalai Lama’s subsequent visit to The Netherlands, Carmen was asked to welcome this great master with a painting of the eight symbols once more. 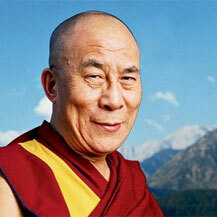 His Holiness the Dalai Lama (born July 6, 1935) is the spiritual leader of Tibet. His official name is Tenzin Gyatso. He is a lama of the Gelug order (also known as the Yellow Hat school of Tibetan Buddhism) that was founded by Lama TsongKhapa in the 14th Century. The Dalai Lama is considered to be the successor in a line of tulkus (reincarnated Tibetan Buddhist lamas and masters) who are believed to be incarnations of Avalokitesvara (Tib. 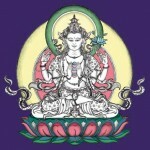 : Chenrezig), the Bodhisattva of Great Compassion. The current Dalai Lama is the 14th in this lineage. In 1950 China invaded and occupied Tibet brutally, leading the Dalai Lama to fled to India nine years later. Since then, he has been campaigning from exile for Tibet to be given greater autonomy. There’s a beautiful quote by the Dalai Lama where he speaks about the meaning behind of thangka paintings.